SolarActive® UV color changing serger and embroidery threads are all the rave! Create unique uv color changing designs that will be sure to impress. A must have for all home and commercial sewers alike. We combine proprietary chemistry with high grade thread to bring you a fantastic high quality color change product made ONLY in the USA! Order Today! Ships Out Next Day! 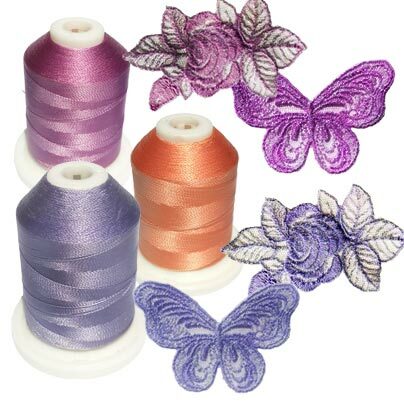 Simply place your mouse over any thread product to see the outdoor color! 7 colors -white indoors changes to pink, purple, orange, purple, blue, green and yellow 200 yards per cone. Changes colors in an instant! This unique product can add color and magic to any piece of clothing. This is for 1 yard of lace, feel free to buy as many as you'd like!